Read the complete walkthrough for the new DaCast paywall. 5. What is and how to set up group pricing? Group pricing grants your viewers access to multiple pieces of content by paying only once, rather than for each discrete content. You can attribute one price to several pieces of video content. Once paid, it gives the viewer access to each piece of content that you’ve included in the group content list (VODs, Live, Package). Please note that group pricing does not include playlists. Group pricing is neither a package nor a playlist. Step 4: Fill in all the required information. As with Pay Per View / Subscription price creation, the group pricing creation process remains the same, except that you need to add a name to your new group pricing. Step 6: Click SAVE when you’re happy with your setup. Your group price will be saved and listed on that page (group pricing tab). The group price and promo code will also display under each monetization tab of the attributed content. Note that editing the group price in the sales group tab won’t affect the contents. The price settings attributed to each piece of content will remain the same. 6. How to apply a promo code to my group pricing? Step 3: Fill in all the information in the popup. 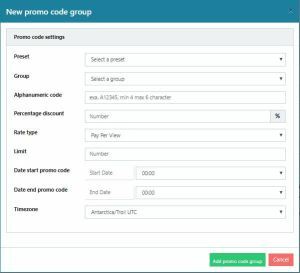 The promo code creation remains the same as when you create a promo code for a regular Pay Per View or subscription price, except that you will have to associate it with a previously created group pricing option in the drop-down menu. 7. How to edit or delete a price, group pricing or promo code? After clicking on “edit,” the popup window will reappear and allow you to change the pricing/promo code information. Note that you cannot edit group pricing by content.